An action packed weekend at the final race of the season saw Michael O'Brien come up one point short on the championship after a puncture in the final race. 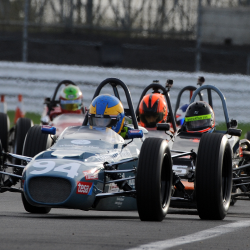 Team Drivers Geoff and Arthur bring home two solid results to end season. Coming into the final race of the season it had been a rather mixed build up after the Friday test with team driver Arthur Atkinson being un well and not able to take part, Geoff having a very unlucky spin which caused damaged and cut the test short and Michael doing limited running. Saturday played host to the only session of the day which was qualifying, Michael O'Brien perfected the tricky session to blast to yet another pole position ahead of title rival Tarling. Geoff and Arthur didn't manage to get a clean lap which left them out of position for race one. In race one both Geoff and Arthur improved there laptimes and enjoyed some great close racing, leaving them in a good position on the grid for race 2. Michael converted his pole position into his fourth Win of the season and extended his lead in the championship standings. It was all down to race 2 on the Sunday and all Michael needed to do was have a solid finish to clinch the title in his first full season of motorsport. the worst luck possible struck at the half way stage whilst leading the race when his left rear tyre would start to lose air. Being a driver that leaves everything on the track Michael Would battle on but ultimately pull of from 8th position on the last lap, a drive that left many of the supporters and fans speachless as he was able to hang on to the leaders for a couple of laps with a tyre that was going flat. Fellow team drivers Geoff and Arthur would enjoy much better races moving up from there starting positions and having some brilliant battles for the season. Overall a fantastic year for the team, Geoff having made some super progress up the order and Arthur getting to grips with the car and battling away from the off. The season will ultimately be remembered for the bad luck sustained by Michael on a couple of occasions which cost him the championship by one point.